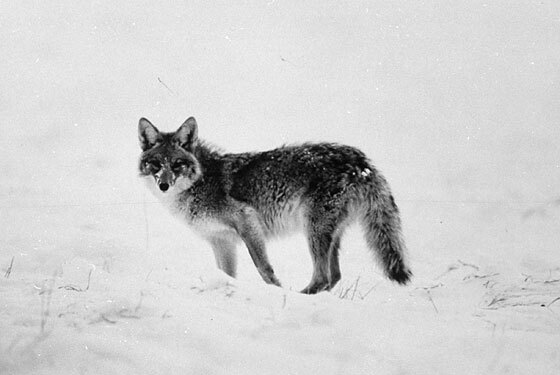 By this week there may not be any coyotes in Central Park—the city has been trying to trap the recent transplants, and frankly, the last time the city tried to trap a coyote in Central Park, in 2006, it didn’t go well for the coyote. But last week, if you were hoping to track one down, then your best bet would have been the southeast corner of the park, across from the Plaza Hotel. According to the best theories, the coyote or coyotes—there could be one or two or more—had made it down here after a long trip from the Bronx or Westchester, through Van Cortlandt Park, across the Amtrak bridge at Spuyten Duyvil, down through Inwood Hill Park, across to Riverside Park, and then through Columbia University, where cops spotted one a few weeks ago. Last Wednesday, just before sunset, two people lingered on the east side of the ice-covered pond, watching the opposite shoreline for signs of movement: a big guy with a backpack full of camera equipment; a small woman in heels texting her husband. “I told him that I’m going to see the coyote today,” Cynthia Gardner said. “It’s on my list of things to do.” She had read about it on Urbanhawks.com. The cameraman was quiet. After a while, Gardner started walking west, to get a look at the other side of the pond. The cameraman maintained his station. In a few minutes, just across the water, in the section of the park known as the Hallett Nature Sanctuary (an area first cordoned off from people in 1934), the coyote appeared. It walked slowly out onto the ice, put out its front paws, stretched. It was about 30 feet from Gardner, and it strolled back and forth a while; it was thin and rangy and lean, at first seeming ill, then strong and wild. “He looks relaxed!” Gardner said. A couple strolling by stopped in their tracks. They were from Nashville. “Is that a dog?” the wife asked. “It’s a coyote!” Gardner said. “Hi, J.D.” She was referring to the coyote as J.D. now, short for J.D. Salinger, a nickname being floated online. The wife seemed to think that coyotes were being raised in the park. “Do they feed them?” she asked. The three people followed the coyote as it wandered west. The Nashville man began using a flash on his camera. This seemed to irritate the coyote. Suddenly, it crossed the ice warily, then jumped a fence at a low point, taking the very walkway the humans were using. It was a week in which a whale trainer was killed by an orca and Travis, the Xanax-fed, human-attacking chimp, made the news again, yet Gardner followed the coyote eagerly. Then, it walked up the stairs, toward Central Park South, the lamppost light on the slick sidewalks making its exit seem very noir. If you looked, you could find its big non-dog-like tracks in the snow. The photographer was still back on the other side of the pond, having missed it. “You saw it?” he said. “I’m glad. People think it’s just a big dog.” He turned out to be the man behind Urbanhawks.com, D. Bruce Yolton, who began to cite some coyote facts: They are more successful in urban areas than in rural areas because of the lack of hunters; they tend to attack only when they’ve become too accustomed to seeking out human food; they avoid dog urine, which is one reason why, he guessed, this coyote was living in the sanctuary, a dog-urine-free zone.